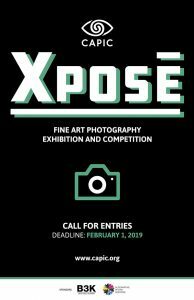 The Canadian Association of Professional Image Creators (CAPIC) is delighted to announce the call for entries for the annual Xposé exhibition! Open to all professional photographers, Xposé 2018 is a curated photography exhibition that showcases works by leading Canadian image creators. We welcome submitted works of all subject matters and aesthetic styles. https://capic.org/events/xpose/ for more details.